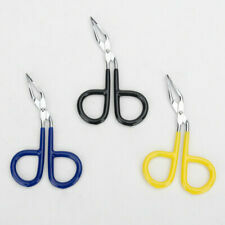 Scissors style handle make it ideal for plucking eyebrows. Tip Width: app 0.3cm/0.11". Material: stainless steel and plastic. Made of stainless steel, plastic handle to hold. 1 Eyebrow tweezers. High quality, long service life - Made of stainless steel,it is corrosion resistant, durable and easy to clean. You will notice. High quality, long service life - stainless steel, corrosion resistant. 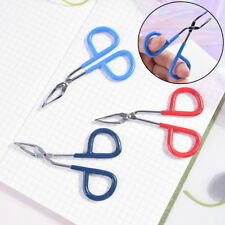 Scissors style handle make it ideal for plucking eyebrows. Tip Width: app 0.3cm/0.11". Material: stainless steel and plastic. Made of stainless steel, plastic handle to hold. Canada, United Kingdom, Austrilia, France, Germany, Spain, Ireland, Italy, Others. 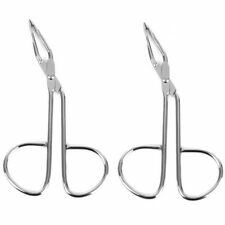 Scissors Flat Tip Eyebrow Tweezers Clamp Clipper Stainless Steel Hair Removal. 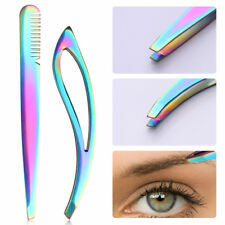 Scissors style handle make it ideal for plucking eyebrows. Made of stainless steel, plastic handle to hold. Net weight: 14g. 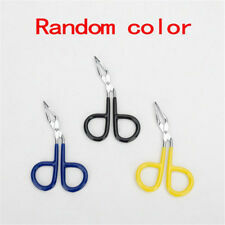 Scissors Flat Tip Eyebrow Tweezers Clamp Clipper Stainless Steel Hair Removal. 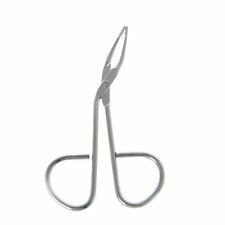 Scissors style handle make it ideal for plucking eyebrows. We will do our best to solve your problem. Wait at least five minutes before applying make-up. Type：eyebrow tweezer. 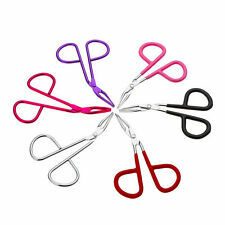 Scissors style handle make it ideal for plucking eyebrows. Size：8.5cm x 5cm. Made of stainless steel, plastic handle to hold. Weight：22g. 1x Tweezer. Easy to use it to remove any unwanted hairs such as eyebrow, brow and facial hairs, etc. Perfect to handle lint, cotton, wool and small objects. Main Colour: Black. Model:Slanted Tip. 100% new and high quality. 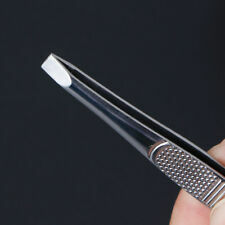 Stainless steel precision-tip tweezer perfect for shaping brows and removing unwanted facial hair. Nickel safe. Type: Eyebrow Tweezer. 1 Pc Eyebrow Tweezer. Model: Flat Tip. Slanted tip with reasonable length for easy use. Remove unwanted facial/eyebrow hair etc. Material: Stainless steel. Color: As the picture shows. Type: Eyebrow Tweezer. 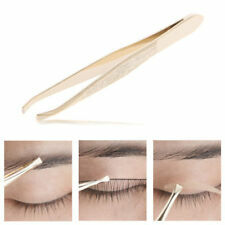 1 Pc Eyebrow Tweezer. Model: Flat Tip. Slanted tip with reasonable length for easy use. Material: Stainless steel. Color: As the picture shows. Suitable for professional using or personal using. Type: Eyebrow Tweezer. 1 Pc Eyebrow Tweezer. Model: Flat Tip. Slanted tip with reasonable length for easy use. Remove unwanted facial/eyebrow hair etc. Material: Stainless steel. We are committed to resolve all issues in a friendly and satisfactory manner. Stainless steel tweezers with comfortable handle and slanted jaw for holding up matter. - Easy to use it to remove any unwanted hairs such as eyebrow, brow and facial hairs, etc. 1 Piece Eyebrow Tweezers. Easy to grab unwanted hair. Suit for remove unwanted facial / eyebrow / hair, etc. - With slanted edge designation, more convenient to trim eyebrow. 1 x Eyebrow tweezer. - The interface was refined by advanced stainless steel material, tightness and durable. 1 x Eyebrow Tweezer(other accessories demo in the picture is not included.). You can use it to remove any unwanted hairs such as eyebrow, brow and facial hairs, etc ideal. Eyebrow Plucking Tweezers is safe and own anti-skid design on the handle. Stainless steel tweezer,sharp and fast to remove your eyebrow easily. Occasions:Body hair remover. Material:Stainless steel. Warm prompt Quantity: 1 pc. You can use it to remove any unwanted hairs such as eyebrow, brow and facial hairs, etc ideal. Eyebrow Plucking Tweezers is safe and own anti-skid design on the handle. Material:Stainless steel. Quantity: 1 pc. Usage: Clip hair, Eyebrow trimming, etc. Material: 430 Stainless steel PU Leather Bag. Our goal is. We will be responsible for. Anti-Rust Stainless Steel Eyebrow Tweezer. Product:Eyebrow Tweezers. Slanted Tip With Reasonable Length For Easy Use. Made From The Highest Grades Of Stainless Steel Machined. - Our team is with the collection of research, production, distribution and service, expect in the good quality with reasonable price and good after-sales service. Type: Eyebrow Tweezer. 1 Pc Eyebrow Tweezer. Model: Flat Tip. Slanted tip with reasonable length for easy use. Material: Stainless steel. We are committed to resolve all issues in a friendly and satisfactory manner. Feature： Brand new and high quality Convenient and useful It is a good gift for your lover, family, friends and coworkers Specifications: Color：silver Size approx：89*7.3*0.8mm Material：stainless steel Package:5PCS Conversion : 1 inch = 25.4mm or 1mm = 0.0393 inch,1cm=10mm If you love my items,please turn to my homepage and click “follow”. Notice: 1. Please allow 1-3mm error due to manual measurement. Please make sure you do not mind before you bid. 2. The colors may have different as the difference display, please understand. Manicure tools to the highest quality standards. This eliminates allergic reactions in people who use the tool, and also makes them durable. High quality manicure accessories are combined with affordable prices.